JLL are a financial and professional services firm specialising in real estate services and investment management. The company employs more than 40,000 people in more than 1,000 locations in 70 countries serving local, regional and global real estate needs, growing the company in the process. Due to our years of experience in commercial property marketing and our long standing working relationship with Jones Lang LaSalle, our Creativeworld team was exclusively selected by Jones Lang LaSalle Investment Director, Fraser Bowen, to design, develop and produce a bespoke brochure for themselves and leading global law firm Clifton Chance, to highlight the benefits of investing in Germany as well as an introduction to German real estate in all its major cities. 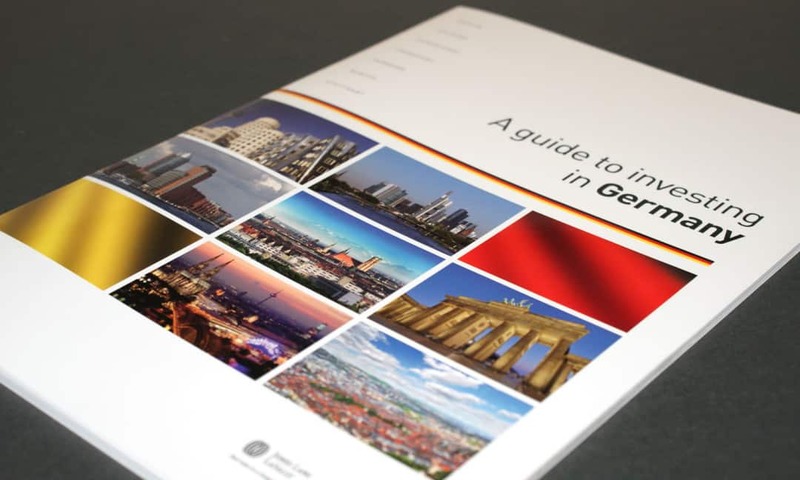 As one of the industry’s most recognised commercial property marketing agencies, we were able to offer all the required skillsets and guidance needed to create a stunning printed brochure titled ‘A Guide to Investing in Germany’. The 44 page brochure was produced with a gloss laminated cover and included high quality art paper throughout. The brochure is filled with cultured photography, custom drawn maps and charts and features detailed in-depth analysis of each major German city, along with information about each area’s unique history and heritage.